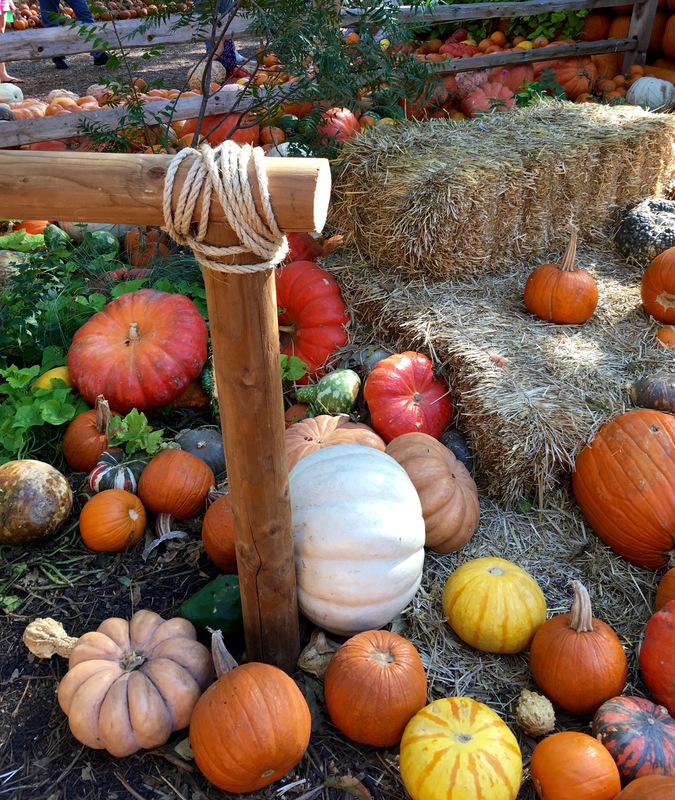 But on a serious note halloween is fun because of the pumpkin picking and carving, the straw bales, hay rides, corn mazes, decorating, and the food ohmygosh the fooood. 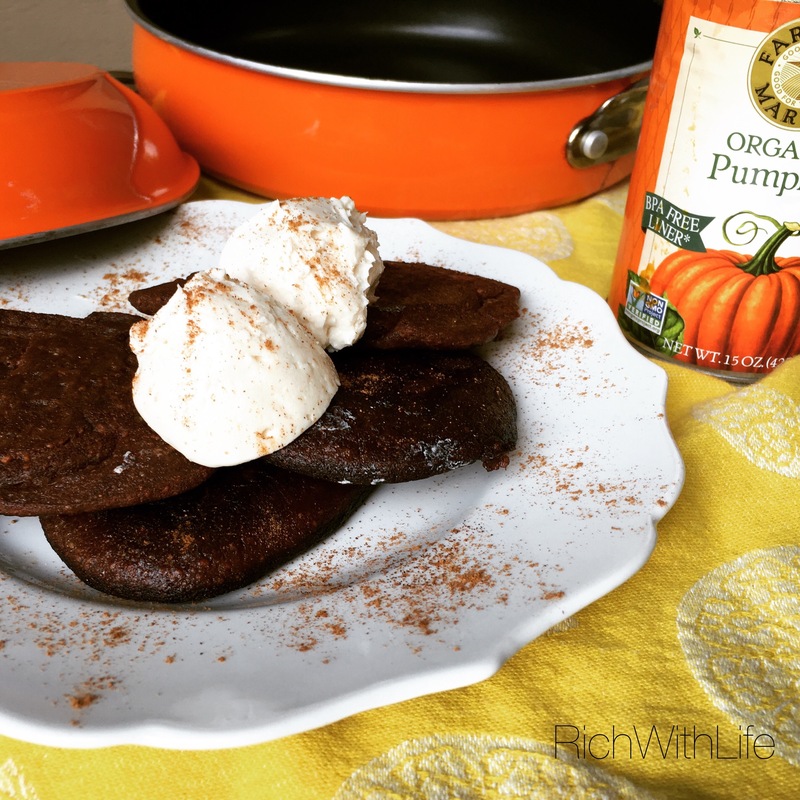 That leads me to my breakfast nearly every day this month: Chocolate Pumpkin Pancakes. The clever Hana over at Nourishing Results created this superstar combination with her kids using uber healthy ingredients that combine to taste like a guilty treat! They are grain free, gluten free, dairy free, refined sugar free, vegetarian, anti-inflammatory, and most obviously kid-friendly. I mean look how cute you can make these! I don’t have a child to hide behind so I’m just gonna lay it all out there… I create these for myself and I don’t even feel embarrassed about it! 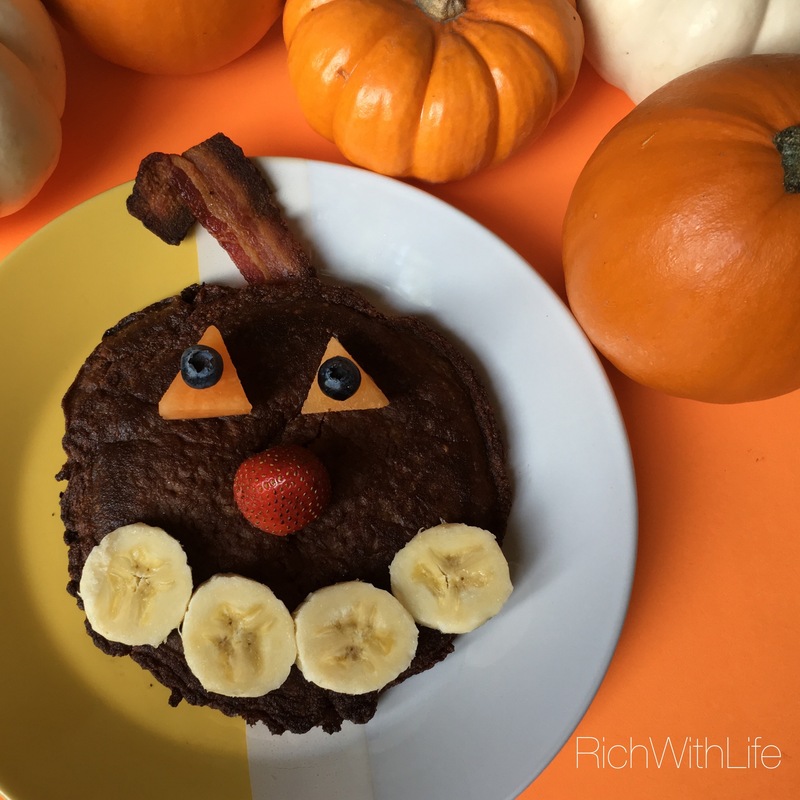 🙂 For the face I used cantaloupe cut into triangles, blueberry eyes, a strawberry nose, and banana smile, topped with bacon as the pumpkin stem. You can do many variations of this with whatever you can find in your fridge! Chocolate chips, whipped cream, candy corn and oreos are more sugary alternatives, but fruit tastes great and is much healthier! In the picture above I used dairy free cream cheese on top, which could also be used to make a face on your pumpkin! I just like this little guy who is looking up at all his “pumpkin” friends – I am such a d o r k.
I hope this pumpkin pancake find it’s way into your home, for the children in your life, or if you’re like me, don’t feel the slightest bit weird making one (or 5) for yourself. My neighbors may look at the 20 something sitting on her porch smiling at the pumpkin pancake staring back at her, but they’re just jealous they don’t have a delicious pumpkin staring back at them! Check out the recipe on Hana’s website here! And while it lasts, soak in all the feelings of fall!